For the past week the Lexicon Devil has been devoted to all of the soon-to-be English majors. I’ve amassed a list of ten books you should strike off your TBR before classes begin in the fall. Our next two recommendations are, for lack of a better term, about madness. However, if you are going to read a couple of books about people who’ve gone nucking futs, these are the ones for you. If I had to pick a desert island book, Kurt Vonnegut’s magnum opus, Slaughterhouse-Five would be the one. 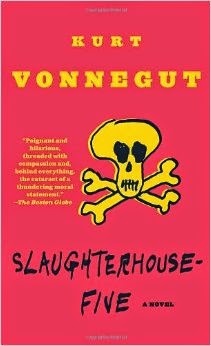 Slaughterhouse-Five is the mind-bending story of Billy Pilgrim, an upstate New York eye doctor who becomes inexplicably “unstuck in time.” Without a moment’s notice Billy can travel to different parts of his life, shifting between the evening of his daughter’s wedding, to his time as a POW in Dresden, to the day his wife died. Billy’s time travels are made all the more peculiar by the appearance of a race of highly evolved aliens who keep the unperturbed Pilgrim and Montana Wildhack, a “blue movie” actress in a habitat on their planet for study. When it comes down to brass tacks, the reason you should read Slaughterhouse-Five is simple: the book is the gentlest introduction to postmodernity you could possibly receive. Once you start your undergraduate work, it will already be assumed that you have familiar with postmodernity and have at least one (or more!) postmodern text under your belt. I am not going to lie, Slaughterhouse-Five is difficult to follow at times, but Vonnegut rewards the tenacious . . . and their are illustrations. ILLUSTRATIONS YOU GUYS! In Annie Hall, a movie you will probably see at least once if you minor in Film or have an overly earnest boyfriend, Woody Allen’s character, Alvy Singer, tartly observes, “Sylvia Plath, whose tragic suicide was misinterpreted as romantic by the schoolgirl mentality.” As glib as that comment may be (and it certainly is glib) it does have a ring of truth: Plath has been hijacked by generations of well meaning fans who wish to turn the poet and novelist into a victim or a spirit animal for the depressed. Sylvia Plath was a woman who has serious mental health issues and didn’t have the intrinsic or extrinsic resources to handle her life when it started crumbling before her eyes. To be frank, were Plath not a gifted writer and an attractive white lady, her story would be relatively unremarkable. 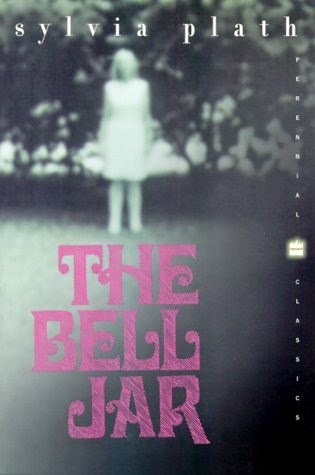 That being said, if you can contain your urge to mythologise, you really should read The Bell Jar, Plath’s only novel. In contrast to many books about young adult madness (including The Catcher in the Rye, sorry to burst your bubble), The Bell Jar has stood up well over time. Plainly put, The Bell Jar is about Esther Greenwood, a Seven Sisters undergraduate, who gets a summer internship at a woman’s magazine, experiences some personal and professional disappointments, and tries to commit suicide. The novel documents Esther’s downward spiral as her slow recovery. Many events in the novel mirror Plath’s life; however, I would caution readers to refrain from reading the novel as an autobiographical text and instead view the plot in relation to the evolution of women’s gender roles. Come back Friday for installments 9 and 10 in the series!